We all have dead skin cells under over feet, and for a lot of us, getting those ‘baby feet’ is just not possible either because we don’t know how to take care of our feet or the treatment are too expensive. Why do we have dead skin cells under our feet? Well, this question is important to answer before reviewing products (such as the Baby Feet – Deep Exfoliation Foot Peel) which guarantee the removal of dead skin cells, because sometimes a little care can save us from the hustle. Why should you worry about your feet and their skin? Facial skin is taken care of appropriately. Ladies and men equally want to have a glowing and impressively nice face. Having a good face leaves a remarkable impression on your fellows, colleagues, employers and other people. But have you thought about focusing and caring about your feet too? A scientific study has proved that people tend to look at feet before face when they are critically looking at someone. So, if you would have a dry, scaly foot skin, it’s going to be visible through your pretty sandals. That’s the actual problem, we buy gorgeous sandals, and we expect our friends to see and admire our choice instead of ignoring feet that are not being taken care of. If you have dull and dead skin under your feet with painful sensations, then you might want to be tested for diabetes. Your feet bear the whole weight of your body, so they need to be taken care of well if you want to walk without facing any problems! The feet are responsible for bearing the entire weight of the body, and due to pressure and dirt, the skin gets dry and starts to wear off. The soles might look scaly and thick calluses start to develop as a reaction by our body. Calluses help to protect against friction, pressure and bacteria but if you do not wash your feet and treat them roughly, then they might become painful, and you will have to get rid of your dead skin. You, as an adult, would tend to roam in the city while doing everyday work. As we know that environmental pollution has exceeded all levels, you might end up having dirty feet after a busy day. When you get home, wash your feet with lukewarm water. Dry skin on the feet and the sole can lead you to many problems, so after you are done with washing, apply some lotion or oils and massage your feet. You must regularly check your feet and soles. Ask a family member to check your soles as you cannot see them directly. If they are too dry, go for various remedies before the condition becomes worse. Take a hot water filled tub and add some shampoo in it. You can also add lemons too; cut them up and drop them in there with the peel attached. Soak your feet in the tub for 30 minutes. Do this twice a week. Apart from the softening feet and cleaning the soles, soaking also helps you to feel less tired even after a whole busy day at work. This peel mask is basically a plastic cover up for your feet. It is filled with a liquid which causes dead skin cells to peel off with time leaving behind new baby skin. These foot masks are surprisingly amazing; you just have to wear these booties for some time then you wash your feet. You start to see positive results in 6 to 7 days with peeling dead skin which wears off with time. Some people might call it gross but having dead, painful, and embarrassing soles is grosser then these booties. Will booties cause you any harm? But do not worry, the chemicals within the booties are safe to apply and use. These conditions only appear for some time and are mere reactions. If you have any cuts on the feet, then you must first wait for your skin to heal before using booties. Your feet and their soles must be free from any kind of cuts. First, wash your feet thoroughly with plenty of water. Take a tub of slightly warm water and add some shampoo in it, soak your feet for about 30 minutes in water. The product comes wrapped in plastic. It is already cut out for your feet size, and you only have to wear it. They will feel slightly slippery. They have a liquid filled in them. Contrary to popular belief it will be better for you to not engage yourself in any activity which might involve walking, just stay where you are. Still, if you have to walk and you cannot just be sluggish for some time, then wear some socks over the booties. In the product description, it is written that you must wear them for 60 minutes at least but do wait a little longer. It is better to wear the booties for 90 to 110 minutes. Do not exceed and do not wear them for too long though. They have chemicals which might cause you to experience some redness and itchiness. After the 90 minutes are up, take off the booties from your feet. You cannot use one bootie for more than one once so just throw it in the dustbin. Wash your feet with water and return to whatever it was you were doing for the day. You have used the booties and washed your feet, the chemicals present in the liquid will take some time to go into your dead skin cells. After day one of using booties, you will not see any apparent changes in your feet, just a little bit of redness. On the second day, you will realize that your soles look redder. Do not get disappointed; you are on your way to having baby soft feet. Third day: for most of the people this is the day when the revolution should begin! Expect to see loose wearing peeling skin. Do not be worried about it though, that’s just your dead skin. That is the point when you will need to soak your feet. Soak your feet for half an hour that will cause peeled skin to get soft and peel off. Fourth day! This is the big day, everyone! Your dead skin is literally going, and you’ll get to see clean new skin in a few days. Do not try to pull off the skin yourself. Instead, take a bath in a tub and not in a shower. Soak your feet in a tub. Rub the soles of the feet with one another. The peeled skin will just fall off. Be sure that the peeling doesn’t cause you pain. So, don’t be too harsh with your feet. The fifth and sixth day will be the same. You will see that your dead skin is peeling off and you will be tempted to remove it by hand but do not do that. Just take baths regularly and soak your feet to get results faster. Finally, on the seventh day, you will get new baby soles, just as you did when you were born. Due to thick callus layer, some people will not get new baby soles in just one treatment. Depending on how hard your callus is and how aged you are, you might need to use the treatment more than once. But still, after the first treatment, you will see a remarkable change. If you do not get peeling skin on the third day, then do not be upset about it. For some people, the peeling may start on the fourth day. Do not use booties if you have any apparent cuts on your feet. Do not apply lotion over the dead skin. Yes, your dead skin will cause dryness but do not apply any lotions. Lotions will only slow the process. Apply moisturizers to the new baby skin and take care of your feet as described earlier. Requires more than one treatment depending on the condition of your feet. Taking care of your feet not only provides you with clean skin, but also helps to relive pressure you might be feeling all over your body. 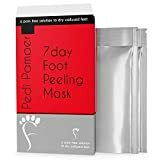 With the Baby Foot Peel Mask you can easily give your feet a treatment that will provide you with positive results in a week. These booties or peels are easy to use and won’t cause irritation.